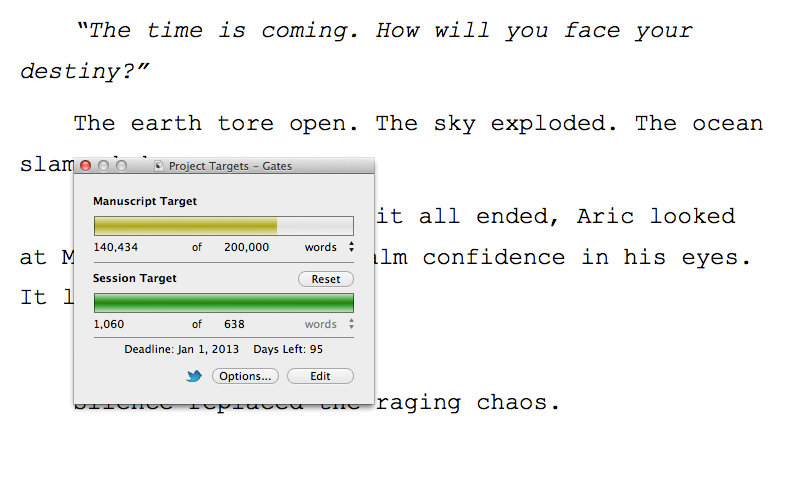 This morning I finished the first draft of chapter 39 on my novel, Beyond the Gates of the Sky. As the screenshot indicates, I’ve written just over 140,000 words in the book so far, which is roughly 400 pages in paperback form. I estimate I’ll reach the end of the story around 200,000 words. I gave myself a deadline of January 1st to reach it, which means I have to do an average of about 638 words each day to get there. Today, I wrote a little over 1,000. Which is good, right? Well, let’s hope the story doesn’t go much longer than 200,000. I suspect it might try to creep past that limit! And yes, yes… for all you publishing folks shaking their heads, I am fully aware that most publishing houses don’t want books that long anymore. Well, my goal is just to write the best story I can. After that, I’ll figure out how to present it or deliver it.